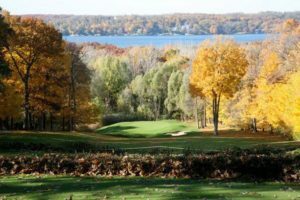 Lake Geneva Wisconsin is known for many things, and great golf definitely makes the list. Around the lake, there are so many great courses you can play, sometimes it can be hard to choose which ones to play at! This article was written by someone who has 30 years of experience golfing in the area, and he has taken the time to rate his top 5. Let’s dive in! Geneva National – What can I say about GN, this place is just an amazing golf destination. Geneva National has (3) 18 hole courses, the Player, Palmer, and Trevino. They were not named after those golf legends for no reason, each player actually designed their namesake course. How cool is that? If you only have time to play 1 of the 3 amazing tracks, I will tell you that my personal favorite is the Player Course. Absolutely pristine course with some great golf holes, and plenty of scoring chances. If you don’t have a choice, you can’t go wrong with any of the 3! Grand Geneva – The Grand is another high end golf destination. Grand Geneva boasts (2) 18 hole courses. The Brute might bring you to your knees and make you beg for mercy, but a good round there means you played a hell of a round of golf! The Highlands is another great track, just not as tough as The Brute, but every bit as picturesque. Abbey Springs – This course is located on the south shore of the lake in Fontana. As someone who was a member there for a few years I can tell you that this course is stunningly beautiful, and extremely challenging. It is nestled in a heavily wooded area, with beautiful homes lining some of the fairways. You will find some awesome views from high above Lake Geneva while enjoying a round at Abbey Springs. This course is a MUST PLAY if you are visiting the area to play some golf! Hawks View – Hawks View is another gem in the area. They have a nice little 18 hole par 3 course, as well as a championship 18 hole par 72 run. When you play at Hawks view you better have a good feel with the flat stick! Hawks view also has a great bar and some tasty food so make sure to replenish after your round! Lake Lawn Resort – Lake Lawn is a par 70 course located on Lake Delavan, in Delavan Wisconsin. Tiered greens that run true will be sure to test your short game. For the most part, there will be a lot of good scoring opportunities when you play Lake Lawn, as long as you keep it in the short grass. Just off the fairways you will find a lot of old, big trees. Get stuck in there and you will struggle to make par. There you have it folks. The Lake Geneva area has a lot of great golf options for you to choose from. I have been golfing around here for a long time, and these are my favorite places to play in the immediate area. There are other fun courses to try that did not make the list, but that does not mean they are not worthy of your business. Now get on out there and have some fun!